At UN, Greece's Bakoyannis Called "Not Ready for Prime Time" by Some: Sri What? 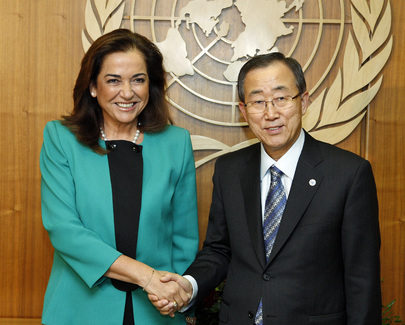 UNITED NATIONS, February 28 -- Dora Bakoyannis, the foreign minister of Greece, was unable on Friday to comment on the 2000 civilians killed this year in Sri Lanka. She came to speak to the Press outside the UN Security Council, which was holding a three-part session on the OSCE, peacebuilding and Sri Lanka. Inner City Press asked for her or Greece's position on Sri Lanka, the debate on which in the Council has concerned the right of a government to kill civilians while fighting a separatist or terrorist group. "I will not comment on that," Minister Bakoyannis said, "I have to catch up with it." Video here, from Minute 5:01. Several Greek observers shook their heads, some embarrassed, some judgmental. Not ready for prime time was the verdict, they said. Beyond such intra-Greek critique, the larger question which we hope going forward to explore is, Does a foreign ministry such as Greece's only take an interest in conflicts outside of their region while they are on the UN Security Council, or are aspiring for a seat? When asked if Russia building military bases in Abkhazia and South Ossetia would be helpful to her and the OSCE's attempts to keep a OSCE mission in these areas, Ms. Bakoyannis answered only that it "should be discussed within the OSCE." Video here, from Minute 4:54. Ms. Bakoyannis did answer, or at least respond to, Inner City Press' question about Nagorno Karabakh, on which she has been quoted that a solution's to be found within the territory of Azerbaijan. She answered by referring to the Minsk process, trying to bring it to a close by the end of 2009. Video here, from Minute 2:11. This answer, but not the Sri Lanka no comment, was picked up by the ANA news service, here. Staff of the Greek Mission to the UN, working around the clock during Ms. Bakoyannis' visit, were to accompany her to the airport after this Council appearance. The Mission is among the more responsive in UN world, on topics ranging from the riots to the intrigue around the U.S.'s planned use of a Greek port by the name of Lobster for weapons trans-shipment. To bring Minister Bakoyannis up to speed on major UN topics, at least those on the Council's agenda on the day that she is there, would be another step forward.